Please go to the following link: http://main.org/brentwood/2011%20Documents/AE%20Tree%20Cutting%202011.pdf to review a public notice to Brentwood residents regarding planning tree trimming around AE's power lines. Be sure to know your rights to ensure that one of Brentwood's most valuable assets, our lovely trees, are handled with care and skill. The City of Austin has received plan amendment and zoning change applications for property located at 5209 Burnet Road and 5211 Jim Hogg Avenue (see location map) within the Brentwood/Highland Combined Neighborhood Planning Area. You have received this notice because you live, own property, or are a member of a registered neighborhood organization within 500 feet of the property. 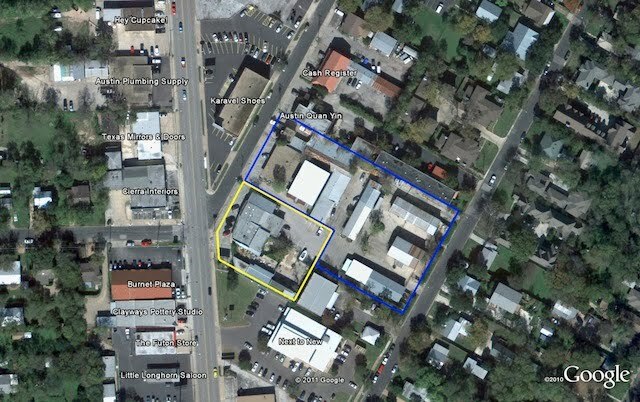 For more information on this case and any related zoning case, you can go to the city’s website at https://www.ci.austin.tx.us/devreview/a_queryfolder_permits.jsp. Si necesita más información en español sobre esta reunión del vecindario Brentwood/Highland Combined Neighborhood Planning Area, favor de llamar a Jacob Browning a 974-7657. The City of Austin is sponsoring a community meeting to provide an opportunity for the applicant, neighborhood planning contact team, nearby residents/property owners and any other interested parties to discuss the proposed plan amendment and zoning case. 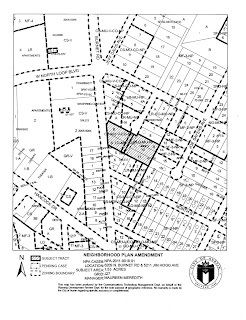 NPA-2011-0018.01—The applicant has requested a change in the future land use map (FLUM) from MIXED USE/OFFICE to MIXED USE. C14-2011-0017—The applicant has requested a zoning change from LO-MU-NP and LO-MU-V-NP (Limited Office-Mixed Use-Neighborhood Plan) and CS-MU-V-CO-NP (Commercial Services-Mixed Use-Vertical Mixed Use-Neighborhood Plan) to LR-MU-CO-NP (Neighborhood Commercial—Mixed Use– Conditional Overlay—Neighborhood Plan) to expand an existing outdoor pottery and plant nursery sales business. After the community meeting is held, the proposed plan amendment and zoning case will be reviewed and acted upon at two public hearings, first by the Planning Commission and then by the City Council. The Planning Commission will make a recommendation and the City Council will make the final decision to approve or deny the request, or approve an alternative to the amendment requested. The public will be provided an opportunity to comment at both public hearings. A notice with the date, time, and location of these meetings will be sent at a later date. Existing Land Use: Mixed Use/Office—An area that is appropriate for a mix of residential and office uses. Proposed Land Use: Mixed Use—An area that is appropriate for a mix of residential and non-residential uses. Existing Zoning: CS -- General Commercial Services district is intended predominately for commercial and industrial activities of a service nature having operating characteristics or traffic service requirements generally incompatible with residential environments. LO – Limited Office district is the designation for an office use that serves neighborhood or community needs and that is located in or adjacent to residential neighborhoods. An office in an LO district may contain one or more different uses. Site development regulations and performance standards applicable to an LO district use are designed to ensure that the use is compatible and complementary in scale and appearance with the residential environment. MU -- Mixed Use combining district is intended for combination with selected base districts, in order to permit any combination of office, retail, commercial, and residential uses within a single development. Allows development of all types of residential uses, including single-family residential, multifamily residential, and townhomes. V or VMU – Vertical Mixed Use building integrates 2 or more land uses in one building with a strong pedestrian orientation. 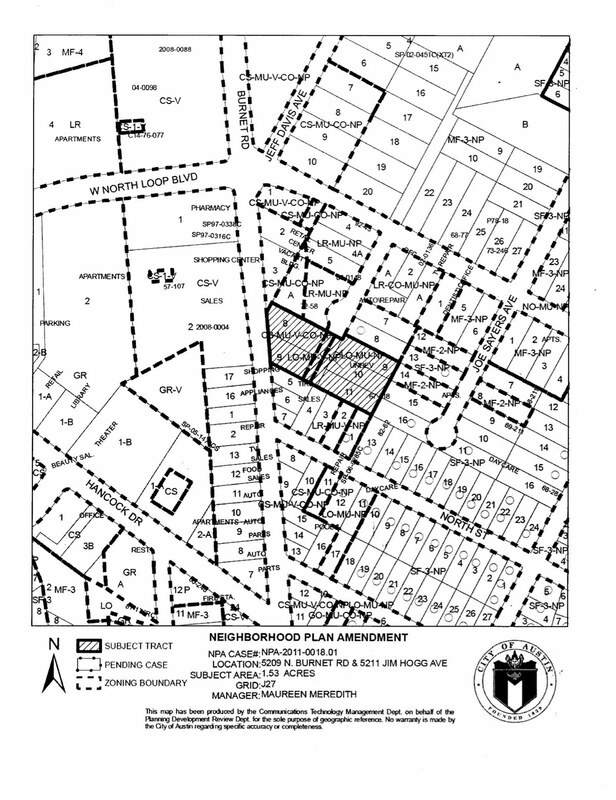 NPCD or (NP) –Neighborhood Plan combining district is a zoning overlay used to implement a neighborhood plan that has been adopted by City Council and to allow certain special “infill” options. The term infill refers to “filling in” vacant parcels of land within a neighborhood. 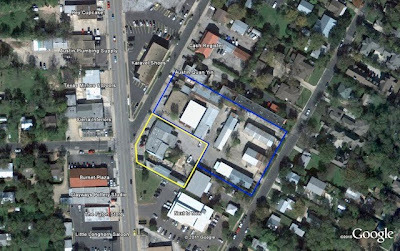 Proposed Zoning— LR -- Neighborhood Commercial district is intended for neighborhood shopping facilities that provide limited business services and office facilities predominately for the convenience of residents of the neighborhood. CO -- Conditional Overlay combining district may be applied in combination with any base district. The district is intended to provide flexible and adaptable use or site development regulations by requiring standards tailored to individual properties. Office hours are Monday-Friday 8:00 am-5:00 pm. The City of Austin is committed to compliance with the Americans with Disabilities Act. Reasonable modifications and equal access to communications will be provided upon request. Please call (512) 974-2695 or TDD/TTY (512) 974-2445. For Sign Language Interpreter or Braille requests, please call at least 4-5 days in advance of the meeting. La Ciudad de Austin se compromete a cumplir con el Decreto de los Americanos Incapacitados. Con solo solicitarlo se proveerán modificaciones e igual acceso a comunicaciones. Para informacion favor de llamar a (512) 974-2695 o TDD (512) 974-2445. Para un intérprete del lenguaje de señales o solicitudes de Braille, por favor, nos llame 4 a 5 días antes de la reunión. The Brentwood/Highland Combined Neighborhood Plan and Future Land Use Map can be viewed at http://www.ci.austin.tx.us/planning/neighborhood/brentwood_highland.htm. To view current crime statistics in Brentwood, you can use CrimeSpot, a web-based map that gets crime info from APD (Austin Police Department). Great resource to view "pockets" of crime and troublesome areas in our neighborhood. The City of Austin has launched a new online service to enhance community engagement and provide a forum for residents to offer suggestions on how to improve the way the City does business. Users can suggest a new service, a service improvement, a policy change or other recommendation. It also invites users to visit subject-specific forums on topics the City is currently exploring. The Communications and Public Information Office will provide oversight to ensure comments remain civil, as would a facilitator at an in-person meeting.